(Organic Slant) Scientists have measured radiation from dishes that expose you to gamma radiation if you’re in the same room as the plate, beta radiation if you touch the plate, and alpha radiation if you eat acidic foods off the plate. The use of uranium compounds in glassware and ceramic tableware has been practiced for several decades. Most of this application was halted by the demand for uranium in the 1940’s, causing substitute materials to be applied. The application of uranium to produce fluorescence or irridescence in decorative glassware, such as vases or candleholders, is still being practiced. Since these products are ornamental in nature and not involved in food handling, they are exempt from Food and Drug Administration (FDA) regulatory controls, and are likely to represent much less of a public health risk than dinnerware. In the case of both decorative glassware and glazed ceramic products, some exposure of the public to ionizing radiation will result. In some instances, these exposures may be significant. Before the 1970s, many companies used radioactive minerals to color glazes. The most commonly used minerals were uranium,thorium and potassium. These elements emit alpha, beta and/or gamma radiation. These glazes can be found on floor and wall tiles, pottery and other ceramics. FIESTA, America’s favorite dinnerware, was introduced by The Homer Laughlin China Company with great fanfare at the Pittsburgh China & Glass Show in January, 1936. FIESTA was the creation of Frederick Hurten Rhead, a second generation Stoke-on-Trent potter who had become Homer Laughlin’s design director in 1927. FIESTA was an immediate hit with the public and, by it’s second year of production, more than one million pieces were produced.. The Fiesta dinnerware line was introduced in 1936 with a choice of five colors: red, blue, green, yellow and ivory. Red was the first color that the company selected when designing the product, and blue was the second (these were the colors of the Fiesta ware that Andy Warhol collected). Since the idea was to mix and match the dinnerware, the five colors had to be compatible. The red color was achieved by adding uranium oxide in the glaze – measurements have indicated that by weight, up to 14 % of the glaze might be uranium. How much glaze was employed per plate is unclear but it has been estimated that a single plate contains 4.5 grams of uranium. 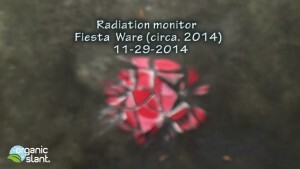 Since this uranium could be used in the production of an atomic bomb, Fiesta red became a victim of World War II when the US government confiscated the company’s stocks of uranium. Fiesta red disappeared until 1959 when production resumed, this time using depleted uranium (DU) rather than the original natural uranium. The Fiesta red plate in the above photo was made from depleted uranium while the ivory plate was made from natural uranium. In 1969 the entire Fiesta ware line was discontinued, and in its place the company produced what was known as Fiesta Ironstone. The latter, which was only manufactured in Fiesta red (aka Mango Red), didn’t last long. It was discontinued in 1973. This was the end of Fiesta red. Years later, in 1986, a new line of Fiesta ware was introduced but without the red color. It is worth noting that the use of uranium to produce a red ceramic glaze was not limited to Fiesta ware. Almost any antique ceramic with a deep orange/red color is likely to be radioactive, e.g., that produced by the Bauer Pottery Company. In addition, various manufacturers, including the Homer Laughlin Company, have used uranium to give their ceramics other colors, e.g., yellow, green, brown. Buckley et al estimated that 2 million pieces of dinnerware between 1959 and 1969 that employed uranium containing glaze. A very detailed analysis of the radiation exposures due to uranium in dinnerware can be found in the Nuclear Regulatory Commission publication “Systematic Radiological Assessment of Exemptions for Source and Byproduct Materials” (NUREG 1717). Buckley et al reported exposure rates of 0.5 and 15 mR/hr at the surface of a dinner plate and 0.002 and 0.3 mR/hr at one meter. Using film badges, Menczer measured beta-gamma dose rates of 0.5 to 20 mrad/hr on contact with various items of glazed ceramic dinnerware. He calculated that the hands would receive approximately 2 to 10 rem per year as a result of handling such dinnerware 1.5 hours per day. Piesch et al. measured 32 mrem per hour at the surface of a red ceramic teacup. Assuming daily use of the cup, they estimated an annual dose to the lips of 400 mrem and 1200 mrem to the fingers. NUREG-1717 calculated the beta dose rates at a depth of 7 mg/cm2 (i.e., the nominal depth of the germinal layer of the skin) as well as the estimated effective dose equivalent. It was assumed that the source was a 10 inch diameter plate with a 20 % by weight uranium content. Kendig and Schmidt measured uranium concentrations of 1.8 to 8.6 ppm (0.6 x 10-6 to 2.9 x 10-6 uCi/ml) in acetic acid that had been in contact with red glazed ceramic dinnerware for 24 hours. The range of concentrations went up to 41 to 51 ppm (1.4 x 10-5 to 1.7 x 10-5 uCi/ml) for 60 hours of contact. Landa and Councell measured uranium concentrations of 3.9 to 10.6 ug/liter (1.3 x 10-9 to 3.5 x 10-9 uCi/ml) in water, 470 to 31,800 ug/liter (1.6 x 10-7 to 1.1 x 10-5 uCi/ml) in acetic acid, and 96,100 to 304,000 ug/liter (3.2 x 10-5 to 1 x 10-4 uCi/ml) in nitric acid. In each case, the solutions had been in contact with the dinnerware for 24 hours. Landa and Councell noted that repeated exposure to these solutions resulted in a reduced leaching of uranium. Based on the above leaching rates for 24 hour contact periods, NUREG-1717 estimated that an individual using nothing but this type of dinnerware might consume 0.21 grams of uranium per year. Then, using an ingestion dose factor of 1.9 x 10-4 mrem/ug, NUREG-1717 estimated that such an individual might have an effective dose equivalent of 40 mrem per year. This was the highest dose calculated in any of the exposure pathways considered by NUREG-1717. A 1992 study by the U.S. Geological Survey found that highly acidic foods can leach uranium from Fiesta ware at levels ranging from 24 to 1,600 times those considered safe for drinking water. The study said acidic foods, such as tomato sauce, sauerkraut, vinegar and orange juice, should not be consumed from such dinnerware. Scientists at Oak Ridge National Laboratory have measured radiation from the dishes. A standard 7″ “radioactive red” plate (not its official Fiesta name) will expose you to gamma radiation if you’re in the same room as the plate, beta radiation if you touch the plate, and alpha radiation if you eat acidic foods off the plate. The answer to those questions is neither simple nor definitive. There are dozens of markings on Fiesta ware and they are often difficult to read or applied with little uniformity. Still, there are a few ways you can examine Fiesta bottom marks and Fiesta ware stamps in order to determine how old Fiesta ware is. Before trying to identify your Fiesta marking, it’s important to note that there are two types of Fiesta logo stamps – ink Fiesta logo stamps and imprinted Fiesta markings. The clues for these different stamps are very different and are not interchangeable. So, what holds true for an ink Fiesta stamp is not necessarily the same rule for an imprinted Fiesta marking! Very important. Remember this. Fiesta backstamps are the ink markings that appear on the bottom of the plate. These Fiesta markings all feature the word “Fiesta” in some form as well as some marking identifying Homer Laughlin as the manufacturer. •If all letters on the “Fiesta” logo are lower case, then the piece of Fiesta is old. •If the letters on the “Fiesta” logo are upper case, then the piece of Fiesta is new. •An “H” appearing on an imprinted Fiestaware marking means it is DEFINITELY new. •No “H” appearing on an imprinted Fiestaware marking means it MAY BE old but could quite possibly be new. Another good indicator of a new piece of Fiestaware is a the new, circular logo. These logos will have a FIESTA HLC USA in a circular pattern, where the word “Fiesta” is actually part of the circle. Again, this is indicative of a new Fiestaware piece but it’s absence is not proof that it is an old piece of Fiesta. •The letters USA or the words Made in USA. Each of these characteristics has its own, somewhat hard to nail down history. The F in Fiestaware has changed considerably since the 1930s. The original Fiesta “F” is always lower case and has no loops. The rest of the words in Fiesta are interconnected. In 1986, when Fiesta was revived, the F in Fiesta was given a distinctive loop, making it appear uppercase. Also, Fiesta started using the Trademark (TM) and Registration (R) symbols after 1986. The remaining letters became disconnected from the F and were then made into all capital letters. The word “Genuine” began appearing sometime in the 1940s. This was in response to the many imitation Fiestaware pieces that were produced in the wake of Fiesta’s success. The words “Lead Free” appeared after January 1992. Read our other post for more information about lead and cadmium in Fiestaware. Other brand names that used uranium-based pigments included Caliente, Early California, Poppytrail, Stangl and Vistosa, according to the federal Food and Drug Administration. While this is by no means an exhaustive list of Fiestaware markings, this may help you provide clues as to whether your Fiesta is vintage or new. In most cases, it is far easier to determine that Fiestaware is new rather than attemping to prove that it is old. This can be quite frustrating, as many newer Fiesta pieces do resemble original Fiestaware markings. 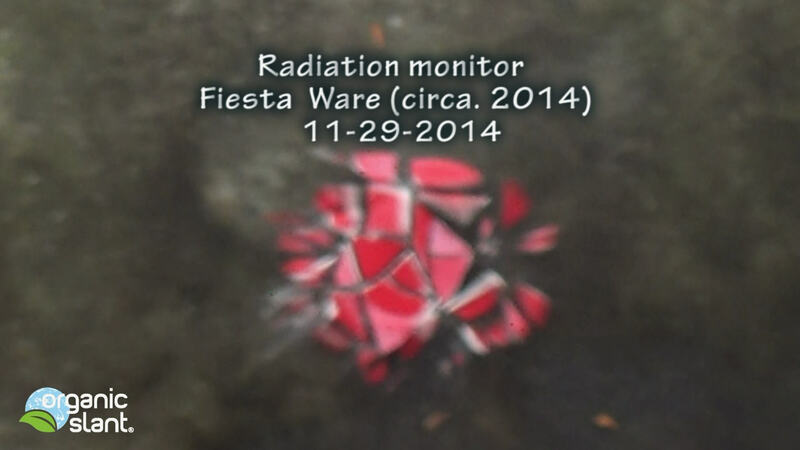 But by knowing which elements appeared later, you can be sure to avoid anyone trying to pass off new Fiesta as old! Basically, you’re not doing yourself any favors eating off the dishes and you certainly don’t want to sleep with one under your pillow. Ingestion of uranium could increase risk of tumors or cancer, particularly in the gastrointestinal tract. Paper plates are a better alternative.